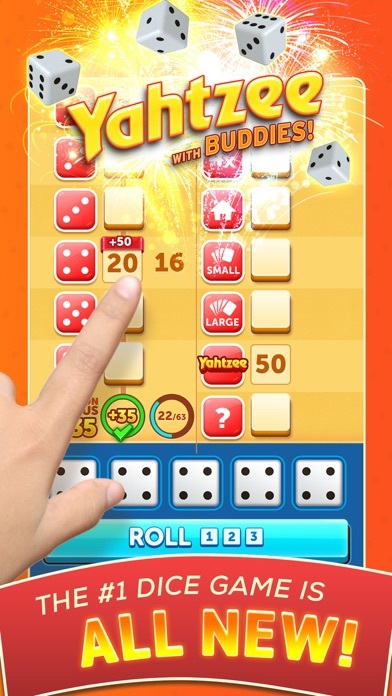 Roll dice to play YAHTZEE® With Buddies! It is the fun, classic board game with a new look. Play dice with friends in this multiplayer game. Challenge your friends to play this family game for hours of endless fun! The #1 dice game is reimagined in YAHTZEE® With Buddies! Puzzle game fan? Poker dice fan? Strategy fan? Then you will love this new two player dice game! Don’t have a clue what YAHTZEE® is? Download it now and you will soon find out! Classic & Fun Board Game on the Go Play the #1 dice game officially licensed by Hasbro, anywhere. 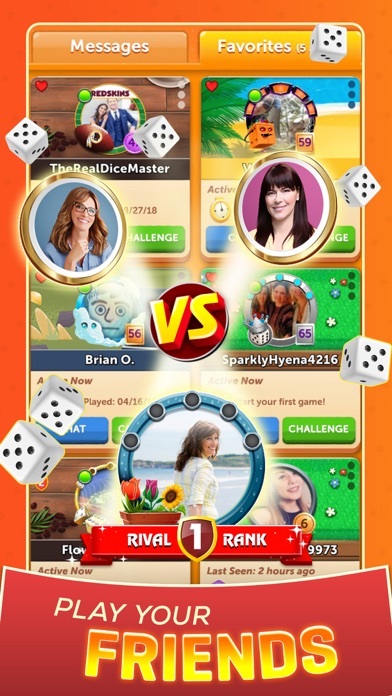 Social game meets dice challenge: Roll dice against other players in epic 2 player game play. Play dice with family and friends: You can chat and send stickers while you play! Join a YAHTZEE® family to get help from your friends! 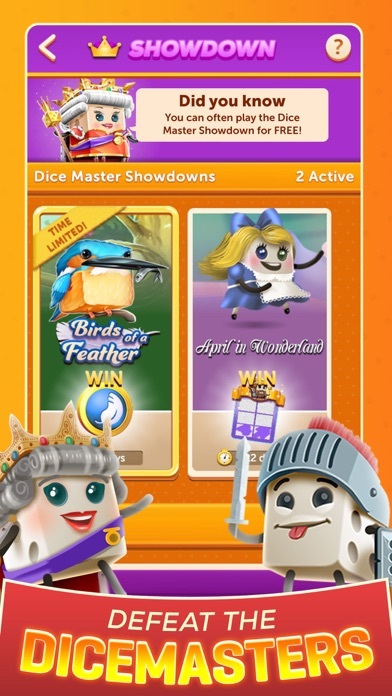 ===YAHTZEE® With Buddies Features=== Dice Master Showdown: • Beat the Dice Master for great prizes! 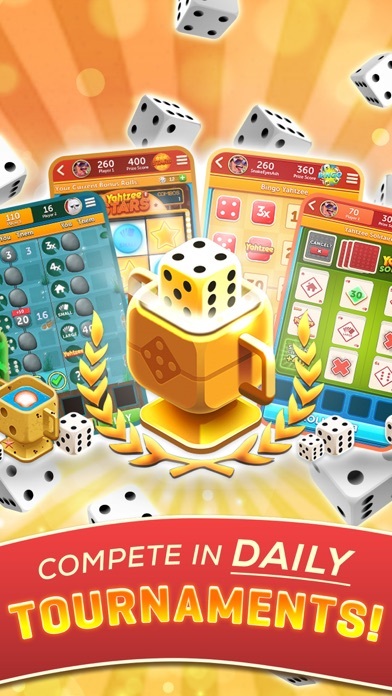 Dice Game Bonuses: • Complete Dice games to win in-game scratchers for a chance to win bonus dice rolls. 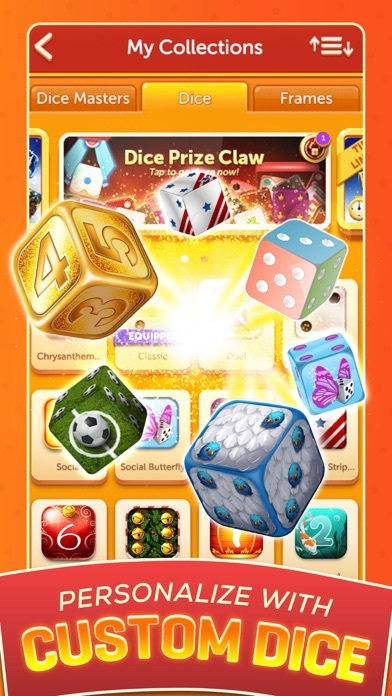 • Activate a bonus dice roll to get an extra dice spin right when you need it. Take part in tournaments: • Dice tournaments are a new, thrilling challenge! Dice Solitaire, Dice Bingo, and Dice Stars are completely new ways to play these classic games! Play through different leagues to win exciting prizes. Social Games with Friends • Play with friends and family. Create your own family in game to get and give help. • Multiplayer games with random opponents. Play dice games with players around the world. 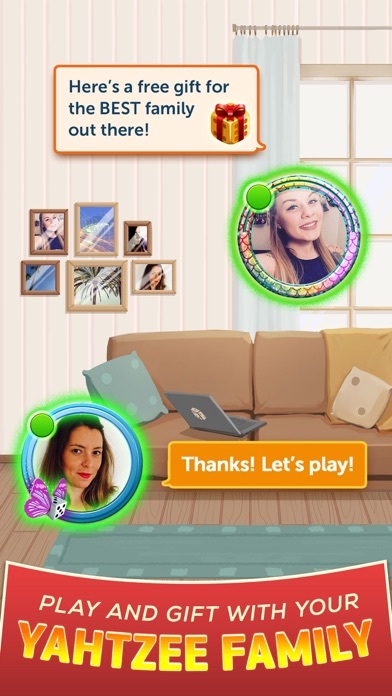 • Chat and challenge your friends with the new social buddies system! Personalize your dice rolling experience: - LOADS OF CUSTOM DICE! - LOTS OF SPECIAL PORTRAIT FRAMES! - TONS OF THEMED GAME BOARDS! Yatzy, yacht, yachty, yatzee, crag, kniffel, balut, farkle, kismet, yamb, or generala, there’s only one authentic Yahtzee! Roll the dice to find out why millions have played this classic family game for over 50 years! Download the app, roll the dice, and prepare to shout “YAHTZEE!” HASBRO and YAHTZEE names and logos are trademarks of Hasbro. © 2019 Hasbro, Pawtucket, RI 02861-1059 USA. All Rights Reserved. TM & ® denote U.S. Trademarks. Funnest way to procrastinate my days!!! Fun to play - it’s not a rip-off like Candy CRUSH. Not sure why. But have had continuous crashes for the past few days. It’s freezing constantly. And saying poor internet connection though my internet is fine. Anytime anywhere. Would add option to offer non playing opponents a chance to bow out and concede game. But why give up? Life and luck changes quickly. This is a great game. The only way it would be better is if you could roll an entire game at one time instead of one roll per turn. Some people take forever just to finish a game.